For other uses, see Numen (disambiguation). Numen, pl. numina, is a Latin term for "divinity", or a "divine presence", "divine will." The Latin authors defined it as follows. Cicero writes of a "divine mind" (divina mens), a god "whose numen everything obeys," and a "divine power" (vim divinam) "which pervades the lives of men." It causes the motions and cries of birds during augury. In Virgil's recounting of the blinding of the one-eyed giant, Polyphemus, from the Odyssey, in his Aeneid, he has Odysseus and his men first "ask for the assistance of the great numina" (magna precati numina). 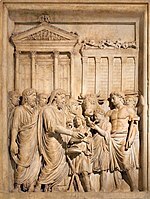 Reviewing public opinion of Augustus on the day of his funeral, the historian Tacitus reports that some thought "no honor was left to the gods" when he "established the cult of himself" (se ... coli vellet) "with temples and the effigies of numina" (effigie numinum). Pliny the younger in a letter to Paternus raves about the "power," the "dignity," and "the majesty;" in short, the "numen of history." Lucretius uses the expression numen mentis, or "bidding of the mind," where "bidding" is numen, not, however, the divine numen, unless the mind is to be considered divine, but as simply human will. Since the early 20th century, numen has sometimes been treated in the history of religion as a pre-animistic phase; that is, a belief system inherited from an earlier time. Numen is also used by sociologists to refer to the idea of magical power residing in an object, particularly when writing about ideas in the western tradition. When used in this sense, numen is nearly synonymous with mana. However, some authors reserve use of mana for ideas about magic from Polynesia and southeast Asia. The literal meaning is simply "a nod", or more accurately, for it is a passive formation, "that which is produced by nodding", just as flamen is "that which is produced by blowing", i.e., a gust of wind. It came to mean "the product or expression of power" — not, be it noted, power itself. Thus, numen (divinity) is not personified (although it can be a personal attribute) and should be distinguished from deus (god). Numen was also used in the imperial cult of ancient Rome, to refer to the guardian-spirit, 'godhead' or divine power of a living emperor—in other words, a means of worshiping a living emperor without literally calling him a god. The cult of Augustus was promoted by Tiberius, who dedicated the Ara Numinis Augusti. In this context, a distinction can be made between the terms numen and genius. The expression Numen inest appears in Ovid's Fasti (III, 296) and has been translated as 'There is a spirit here'. Its interpretation, and in particular the exact sense of numen has been discussed extensively in the literature. The supposition that a numinous presence in the natural world supposed in the earliest layers of Italic religion, as it were an "animistic" element left over in historical Roman religion and especially in the etymology of Latin theonyms, has often been popularly implied, but was criticised as "mostly a scholarly fiction" by McGeough (2004). The phrase "numen eris caeloque redux mirabere regna" appears on line 129 of the poem Metrum in Genesin, attributed to Hilary of Arles. Innocue vivito, numen adest (Live blameless; God is here.) was the motto of Carl Linnaeus, taken from Ovid's Ars Amatoria (I, 640). Nil sine numine is the state motto of Colorado. Its origin could be the phrase "...non haec sine numine divum eveniunt" (...these things do not come to pass without the will of Heaven) from Virgil's Aeneid (II, 777). Numen lumen (God is the light) is the motto of the University of Wisconsin–Madison and Elon University. The term numen appears three times (142.23, 162.13, 282.21) in James Joyce's Finnegans Wake. ^ a b For a more extensive account, refer to Charlton T. Lewis; Charles Short. "numen". A Latin Dictionary (in Latin). Perseus Digital Library. ^ Cicero. "De Divinatione". Loeb Classical Library; penelope.uchicago.edu. I.119-120. Marci Tulli Ciceronis. "De divinatione Prior" (in Latin). The Latin Library. I.119-120. ^ C. Cornelius Tacitus. "Annales" (in Latin). Perseus Digital Library. 1.10. ^ C. Plinius Cæcilius Secundus. "Letters" (in Latin). Perseus Digital Library. 9.27.1. ^ T. Lucretius Carus, De Natura rerum, 3.144. ^ Lucretius; R. Allison, Translator (1919). On the Nature of Things. London: Arthur Humphries. ^ Rose, H. J. (1926). Primitive Culture in Italy. Methuen & Co. pp. 44–45. ^ Fishwick, Duncan (July 1969). "Genius and Numen". Harvard Theological Review. 62 (3): 356–367. doi:10.1017/s0017816000032405. Reprinted in Fishwick, D. (1990). ^ Fishwick, Duncan (May 1970). "'Numina Augustorum". The Classical Quarterly. New Series. 20 (1): 191–197. doi:10.1017/s0009838800044773. Reprinted in Fishwick, D. (1990). ^ Ovid. Fasti. Translated by Frazer, James George. Loeb Classical Library Volume. Cambridge, MA, Harvard University Press; London, William Heinemann Ltd. 1931. ^ Rose, Herbert Jennings (October 1935). "Nvmen inest: 'Animism' in Greek and Roman Religion". Harvard Theological Review. 28 (4): 237–257. doi:10.1017/s0017816000023026. ^ Kevin McGeough The Romans: new perspectives 2004:179 "Numinous Forces and Other scholarly Inventions"; "Scholars may have to content themselves with nodes of meanings for the Italic gods rather than hard-and-fast definitions," observes Charles Robert Phillips III, in "A Note on Vergil's Aeneid 5, 744," Hermes 104.2 (1976:247–249) p. 248, with recent bibliography; Gerhard Radke's classification of the forms and significances of these multifarious names in Die Götter Altitaliens (Münster, 1965) was criticized as "unwarranted precision" in the review by A. Drummond in The Classical Review, New Series, 21.2 (June 1971:239–241); the coupling and uncoupling of Latin and Italic cognomina of the gods, creating the appearance of a multitude of deities, were classically dissected in Jesse Benedictus Carter, De Deorum Romanorum Cognominibus: Quaestiones Selectae (Leipzig, 1898). ^ Gottfried Kreuz; Pseudo-Hilary (2006). Pseudo-Hilarius Metrum in Genesin, Carmen de Evangelio: Einleitung, Text und Kommentar. Verlag der Österreichischen Akademie der Wissenschaften. ISBN 978-3-7001-3790-0. Retrieved 9 April 2012. ^ Pavlovskis, Zoja (December 1989). "The Pastoral World of Hilarius' "in Genesin"". The Classical Journal. 85 (2): 121–132. ^ Benjamin Daydon Jackson; Theodor Magnus Fries (22 December 2011). Linnaeus. Cambridge University Press. ISBN 978-1-108-03723-5. Retrieved 9 April 2012. ^ University of Wisconsin-Madison Unified. "Numen Lumen / School Motto". Kb.wisc.edu. Retrieved 2017-01-05. ^ Clive Hart; James Joyce (1974). A concordance to Finnegans wake. P. P. Appel. Retrieved 9 April 2012. Fishwick, Duncan (1990). The Imperial Cult in the Latin West. Brill. Rudolf Otto (October 2004). The Idea of the Holy: An Inquiry Into the Non Rational Factor in the Idea of the Divine 1926. Kessinger Publishing. ISBN 978-1-4179-7875-5. Retrieved 9 April 2012.